Railay, also called and pronounced as Rai Leh situated in the south of Thailand is a true luxurious paradise. Its exact location lies between Krabi city and Ao Nang in Thailand. 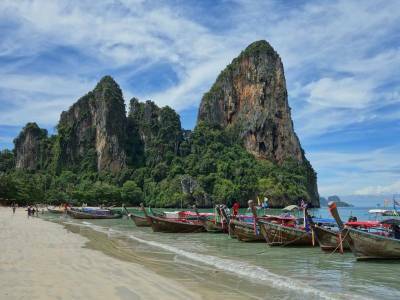 The peninsula of Railay is an isolated one from the mainland being surrounded by the Andaman Sea, twisted rock and lush green jungle. There are plenty of adventure activities that await adventure lovers in Railay. It is indeed the ideal place in Andaman for rock-climbing. And for those who want to relax and enjoy a secluded stay in the tropical paradise, there is the perfect opportunity to do just that as well. Railay these days is a more crowded place than what it used to be. Owing to the high limestone cliffs cutting Railay is accessible by boat only. Ton Sai, Phra Nang, East Railay and West Railay are the four main areas of Railay. Phra Nang can be a busy place and is a 20 minutes distance by long-boat from Ao Nang. It is a white sand beach. The scenery here is scintillating and is a very fine swimming beach especially when the tide is high. However, the beach is not in a very good state now as it is getting spoiled by traffic, pollution, noise, lager lotus, over-enthusiastic hawkers, etc. Railay East is not much conducive for sunbathing or swimming. It is the mangrove side of the peninsula. 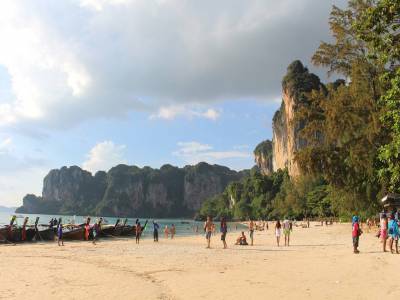 Railay West is a good beach of white sand and shallow water. Swimming is very favourable in the beach’s north end. However, the beach is not at all suitable for using during low tide. Ton Sai is a cove where backpackers and rock climbers can retreat in relatively cheap accommodations and engage in climbing training. 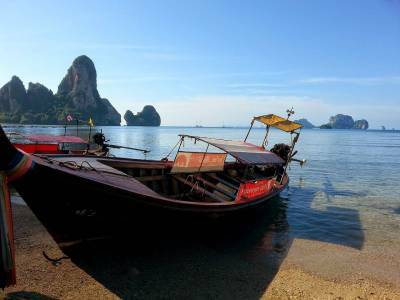 Railay thereby is not only a much popular destination of Thailand but of the entire world as it offers affordable luxury, stunning beauty and thrilling adventure activities. Get quick answers from travelers who visit to Railay.